Hello Dear, Welcome to Teletalk 15GB Internet 900 TK Offer with Validity 30 Days. The Bangladehi Government Telecommunication company Teletalk brings a very big offer for their valuable customers. 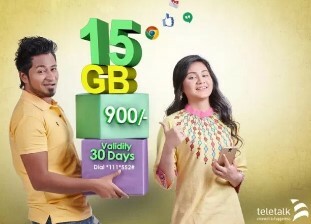 All the Teletalk Prepaid and Postpaid connection users are eligible to buy Teletalk 15 GB 900TK Interent Offer 2017. If you are a Teletalk prepaid or postpaid customers and searching big Teletalk Internet Package in cheap rate with validity 1 month, We recommend you first check the Teletalk 15GB 900 TK Internet Offer Details Information. To activate Teletalk 15GB@900TK Internet Offer, Customers need to Dial USSD Code *111*552#. Customers can also activate this Offer by sending a message. Prepaid customers need to Type “D26” and Postpaid need to Type “F28” and send 111. Customers can activate this Teletalk 15 GB Internet Offer as many times as they want during offer period. The validity of Teletalk 15GB Internet 900 TK Offer 30 days. Customers can use this Teletalk 15GB Offer both 2G/3G area networks and uses time 24 hours. Teletalk Balance Check: just Dial *152# or Type “u” and Send to 111. The Teletalk 15GB @ 900 Taka Offer will run until further notice. Thanks for staying with us a long time and visiting Teletalk 15GB Internet 900 TK Offer 2017 article. If you have any confusion or question about the Teletalk 15GB Offer 2017, Just comment here. We reply as soon as possible with a correct answer.